In this post we take a look at what's possible when integrating Couchbase and its document store with Neo4j and its graph store. Read on to find out more. Editor’s Note: This presentation was given by Lorenzo Speranzoni at GraphConnect Europe in April 2016. LARUS has been a Neo4j partner since 2015. We’re based in Venice, Italy, and provide consultancy and training. The company was founded in 2011 when Neo4j was only in the first version of its release. At the time, we were working for a retail company and the goal was to arrange all the articles and clusters of articles inside a graph database. That’s right about the time we met with Jim Webber and started learning about Neo4j. In 2015, we decided to become a Neo4j solution partner, and last year we started the process to become Neo4j certified as well. one of which was published by William Lyon for MongoDB, that provides instructions for this conversion. How can we convert this data into a graph? The Couchbase listener (1) listens for documents that are either changed or created inside Couchbase. This listener then transfers the mutated document inside the graph through our Neo4j server extension, which is a JSON loader (2) that can actually load JSON coming from any source. (We separated the two projects, which you can now find in our own GitHub repository.) We have another server extension, Neo4j Mutation Listener (3), that looks for changes to nodes and relationships and reconstructs them in Neo4j. 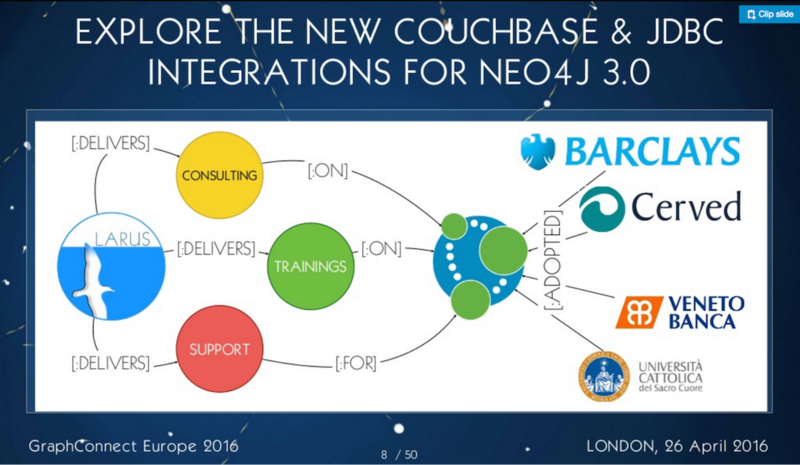 The Neo4j JSON loader (4) transfers the JSON to Neo4j through the Couchbase software development kit (SDK) tools. But what about the domain? How can we instruct the domain — the JSON loader — about how our business domain is configured and then match this within Neo4j? The resulting query that we create translates the JSON into a big Cypher statement. MERGE album ID is the simple part, because we already told the JSON loader that the ID is the unique key, and then we have the set of information that was updated for this node. The second thing we did was contribute to community drivers for Neo4j 3.0. Of course, as a Java company, we have this expertise so it was natural to start working on a standard JDBC interface. We have Stefan and Michael, both from Neo4j, who coordinated the development with the LARUS team. And we have Ralph, a friend from Germany who helped with testing and Benoit from Neo4j who worked on the ACTP protocol. Without them, we couldn’t have built a successful product. The driver took advantage of the new Bolt protocol in Neo4j 3.0. The tool has a modular design because it isn’t very fast; it’s quite heavy because of all the different ways in which you can interact with the database — HTTP, Bolt, in-memory, file — are merged into one module. The idea is that you can decide which way to interact with the Neo4j, and you import just the specific part that you are interested in according to the application that you are developing. And finally, the product is heavily tested and is focused on performance. The Neo4j team recently produced a Java driver, which is the Bolt implementation of the driver. As I mentioned earlier, it’s heavily tested — we have 460 classes, almost 300 unit tests and 15 technician testers, so every single piece of code that we have implemented has lots of testing on top because so that you can use it in your production environment. So have fun with us, please — we need the help, and there’s lots of work and fun things to do. Published at DZone with permission of Lorenzo Speranzoni . See the original article here.